Pop culture nerds, Animation Souk on Church Street is where you need to head to score cool merchandise like keychains, graphic tees, posters, and accessories. It's perfect for gifting or growing your own collection! Feast your eyes on everything that reminds you of the galaxy far, far away, Asgard, or even Sheldon and Leonard’s apartment! It's a haven for pop culture enthusiasts and it stocks up on every imaginable merchandise from all your favourite TV shows, movies, comics, video games, and manga. The store’s got all the latest graphic tees featuring favourite characters from DC and Marvel. Plus, they have a lot of anime tees for all you Naruto, Bleach and One-Piece fanboys and girls. No more having to wait for Comic-Con to sport a Straw Hat Pirate tee! Keychains, bottle openers, wallets, badges, mugs, posters and stationery are other merch you can browse and stock up on. The poster collection is perfect for anyone looking to adorn the walls of their bedroom or even office. You'll find movies and TV series posters such as The Dark Knight, How I Met Your Mother, and Doctor Who. 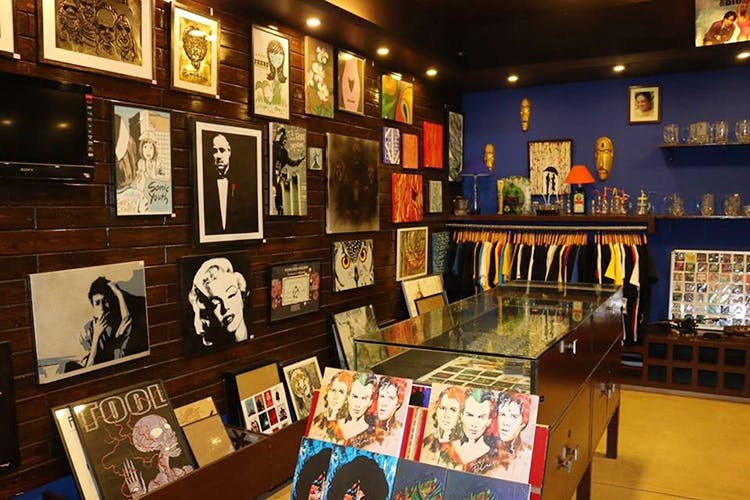 The store also has non-pop culture merchandise like decoupage alcohol bottles, 3D artworks, paintings, and sports merchandise. Pop culture snobs, most of their nick-knack merchandise such as bottle openers, keychains, especially their keychains, and fridge magnets aren’t licensed. But when things like Mjolnir and Batarang keychains look amazing, we don’t mind the lacking authenticity. Look out for the cool Bombaat-branded tees that have just Bangalore things (funny and relatable ones) printed on them.